Every so often I get an email from Ted Kooser that includes a poem so good, so startling that I have to reproduce it here on these pages. This is one. Surprise! 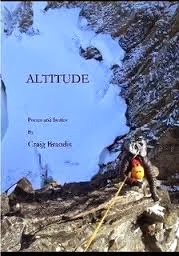 “Altitude Poems and Stories” by Craig Brandis was just published; a slick covered chap book with some marvelous images. Though slightly melancholy, the poems are filled with surprising images. I didn’t know Brandis could write this well. Some poems seemed to be lifted from masters, themselves. Copyright © 2013 by Kim Addonizio. Used with permission of the author.